Briefing Features of Outlook PST Upgrade Software!!! Explore more with PST upgrade!!! 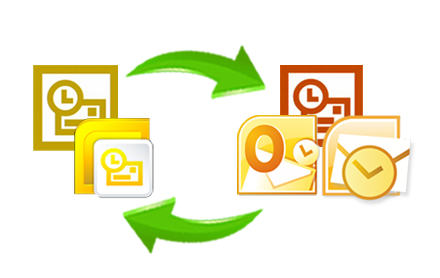 Outlook file up-gradation can be done in bulk using PST Upgrade tool. As this program permits you to switch PST file of Outlook 2000/2002 formats into newer Outlook versions 2003/2007/2010 which are in Unicode format. If using Outlook latest versions like: 2013/2010/2007/2003 then by default PST file will be created in Unicode file format. 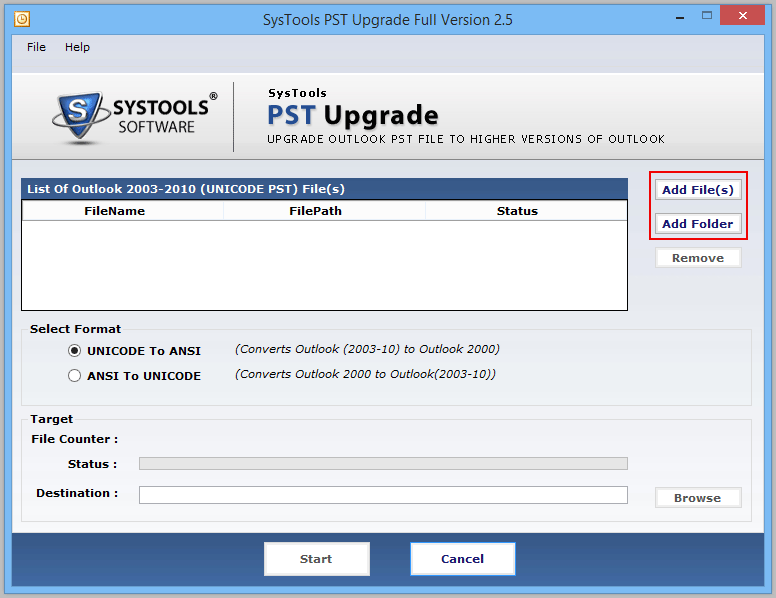 In order to use PST file in Outlook older versions like: 2000/2002 you need to downgrade PST file from Unicode to ANSI PST file format through PST Upgrade utility. Both Up-grading and downgrading of Outlook data file will create a new file of either Unicode or ANSI type. And these, Outlook data file (.pst) will have all items from source PST file namely contacts, emails, calendars, notes, tasks, journals and to-do-list etc. PST upgrade tool permits you to add number of PST files or folders having multiple files. In this manner you can export multiple PST files altogether. It also provides a button to directly remove Outlook PST file from being upgraded or downgraded. Support both ANSI and Unicode PST files, but if you add a UNICODE PST file while up-gradation and ANSI PST file while downgrading then deficient result will be received. Due to selection of wrong data file software will generate an alert message reporting about same. After converting Outlook data file (.pst) you can save file at desired location on conversation machine or attached external device. It is also possible to generate a new folder form software panel and restore data into it. To start the process add PST file or folder that contains multiple PST which will help in Bulk PST Up-gradation. Choose the desired format to go with. 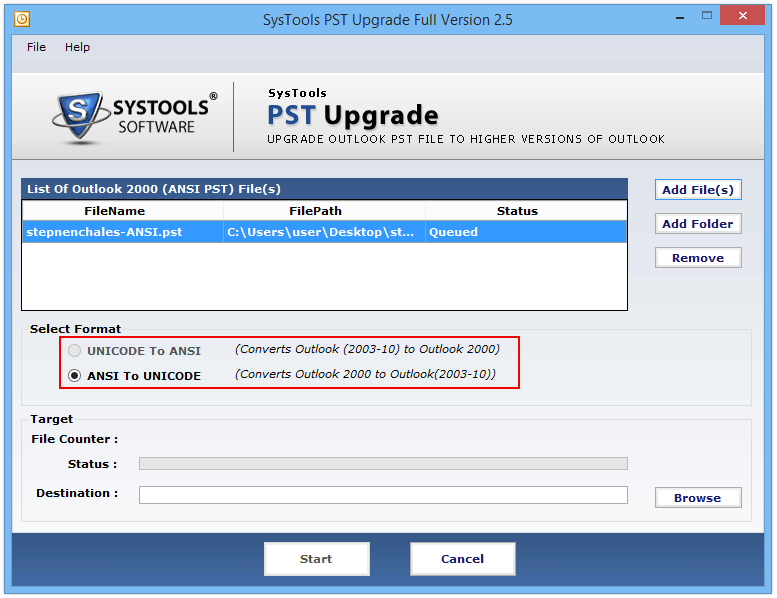 Either converts into ANSI PST for Outlook 2000/02 into Unicode PST for Outlook 2003/07/10 or vice versa. After filling all the required credentials select the desired saving location for restoring the upgrade PST file & trigger the start button. Download PST Upgrade toolkit as it helps you in upgrading or downgrading first three folder of ANSI or Unicode PST file without paying any charge. For switching data in between ANSI to Unicode PST, this tool is most suitable solution to use. The short video of software shows and elaborates the complete process of conversion. The free video accurately assists in between process of Outlook upgrading process deeply. After watching it you can independently run software without having any technical knowledge. For any further query our technical team is available 24*7.